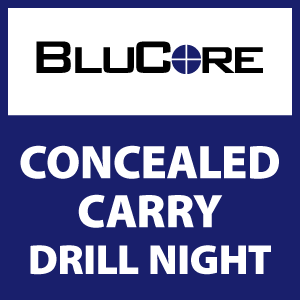 The BluCore Concealed Carry Drill Night was designed for people looking to continue their concealed handgun training in a live-fire environment. During this class, a quick review of holster drawing is done in the classroom, then students go to the range for a series of live-fire drills. Drills will focus on some challenging and atypical shooting positions that are hard to practice on a typical firing line, including shooting from a seated position and shooting while lying on your back. This class is valuable to anyone carrying a concealed handgun for self-defense in or outside the home. Responsible Concealed Carry permit holders should be confident in their ability to draw their weapon and engage targets effectively and safely, this class will help establish those skills! While specifically developed to enhance the proficiency of concealed carry permit holders, this course does NOT meet the training requirement to obtain a Colorado Concealed Carry permit and does not cover the assembly, disassembly or cleaning of a firearm. Requirements: Participants must have taken a concealed carry pistol class and must be comfortable drawing from concealment with your own pistol and holster. Each student will need a holster, pistol, and 100 rounds of ammunition.